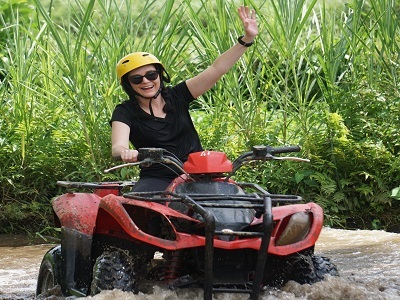 Bali ATV Ride and Tanah Lot Tour packages is the entrancing Bali Combination Tour Packages we outlined by provide for both of you distinctive experience of riding ATV bicycle through the beaten track and afterward going to Tanah Lot Temple and other visitor end. Is extraordinary and noteworthy visit packages we offer to make your vacation more amazing in this Bali ATV Ride and Tanah Lot Tour packages. To start the adventure, you will be riding the ATV bike with our expert ATV Ride instructor through the beaten track with length of time 2 hours. after the journey of atv ride finish we will having lunch with Indonesian food, after lunch finish we continue this adventure to visit Taman Ayun Temple is Balinese Hindu sanctuary in Mengwi town, this sanctuary has excellent perspective with big fish lakes encompass the sanctuary and this sanctuary was construct by King of Mengwi town. At that point we proceed the tour to visit our last site in this astonishing Bali ATV ride and Tanah Lot Tour is the Tanah Lot Temple, is Balinese Hindu sanctuary spotted in Tabanan Village with Breathtaking perspective of Indian Ocean, the sanctuary was popular along the tourist and was the most pavorite place to visit in Bali. You will enjoy the adventure with our private car and expert Bali Driver with offer the excellent Bali Tour Service to make your trip more stunning. The following is the description of site we will be visit during the interesting ATV Ride Adventure and Tanah Lot Temple Tours.